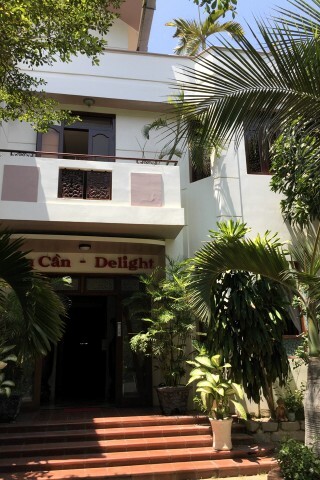 Delight Hotel, also known as An Can Hotel, is your typical guesthouse-esque local hotel offering solidly built, generic rooms at a reasonable price. Average rating 8.2 from 432 reviews. It’s nothing to write a postcard home about but it’s a safe bet for a private room with a few extras. Those extras include a solid wood desk, mirror, flatscreen TV, bedside table, WiFi, air-con, minifridge and a large wetroom bathroom with hot water shower. Linens look clean and you get a top sheet, a local hotel rarity. The room we saw had a big bay window that let in lots of natural light but oddly, the window was your access to the private balcony – that’s right, there was no door to it. The window was low enough to climb out. English is limited and they couldn’t tell us what the upcoming high season rates would be. These head scratchers aside, this hotel would suit most flashpackers just fine. Delight Hotel is centrally located, closer to the Russian tourist strip.